I feel blessed to have been able to spend so much time with my maternal grandmother. As we laid her to rest on what would have been her 91st birthday in January her words “I never expected to live a day past 50” came to mind. Flooded with the emotions of losing my greatest inspiration and source of unconditional love, I realized that her torch needed to be carried forward. This will not be an easy task because Nonna Angela was the strongest person I ever met. If her life had lasted only as long as she expected, then she would never have met me or been able to inspire me – both personally and professionally. Born to Calabrian immigrants in Pennsylvania in 1923, my Nonna became an exemplary daughter, sister, mother, wife, friend, grandmother, aunt, and employee. Her obituary listed the school that she attended and the places she worked but there wasn’t enough space to include all of her talents. She was also a self-taught and amazingly talented artist, painter, designer, home decorator, cook, creator, baker, floral arranger, cake decorator, seamstress, and knitter. Witnessing Nonna do all of these activities seemingly effortlessly and with such success instilled in me the belief that, with determination, anything could be achieved. In addition to her “the sky is the limit attitude”, Nonna led by example instead of by words. Surrounded by her constant steady support, endless love, strong actions, pride, respect, and dignity, it would have been very difficult not to thrive. While she taught me many lessons, there are a few in particular which I draw upon daily for strength. See the divine in everything : Although I always loved my grandmother, I never knew just how special she was. At age 8, I asked her to help me with my Sunday school homework – an assignment to put a check mark next to all the things that God created. I checked the sea and the animals but Nonna asked me why I didn’t check the chairs and the pencils. I said “Nonna, man made those – the teacher said so.” She said, “Amy, God made man. So, if you’re teacher doesn’t see the connection, tell them they are in the wrong profession.” Needless to say, the teacher didn’t get the connection but I did. Feeling a connection to the divine makes daily life more enriching and satisfying and I wouldn’t know this if it weren’t for her. Be thankful : Nonna had many reasons to complain about her circumstances but she never did. She survived sickness, betrayal, poverty, car accidents, surgeries, deaths of siblings, sexism, harassment, abuse, prejudice, and more. When her eldest son died unexpectedly a few years ago, she was devastated but she never questioned his destiny. He was the light of her life. She spoke eloquently at his funeral, with the poise of a politician, and thanked God for giving her the time that they had together. It was one the most painful moments of her life yet she never complained. I am embarrassed when in comparison, I think of the things that I lament about. Understand the importance of food, family, and tradition : Each holiday was ushered in with traditional Calabrian baked goods that Nonna learned from her mother, who had learned from hers, and so on. Foods like Petrali and Mostaccioli cookies at Christmas, and Cuzzupe di Pasqua, Easter Bread, at Easter, were a common staple at our family table. These recipes are just some of the many that signify the quality time that Nonna spent with us and the rituals that she passed along. It gave me great pleasure to know that, after 3 generations in the United States, we ate the same holiday specialties as our relatives in Italy did. When I was a teenager and my mother went to work outside of the home, I was assigned the “chore” of cooking for the family. My mom used to leave foods in the refrigerator for me to prepare after school. I felt completely unprepared for the assignment so I would call Nonna, list the ingredients on the phone, and she would tell me what to make, walking me through the preparation, step by step. 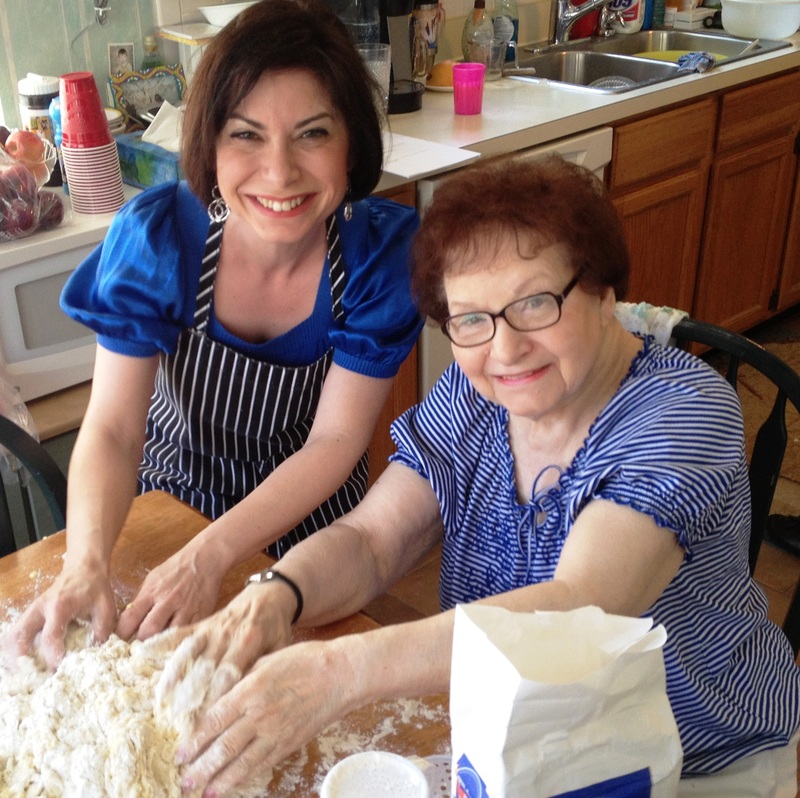 Nonna Angela gave me my first cookbook and I was addicted. I would look up my mystery ingredients in the index and challenge myself to create the tastiest dish possible with what I had on hand (sort of like the television show Chopped). Cooking and writing recipes became my greatest joy. Most importantly, Nonna taught me “that food is the foundation upon which our families, communities, cultures, and lives are built.” It is this observation that led me to becoming a culinary anthropologist. I never dreamt, growing up, that her lessons would one day translate into a food career that has given me accolades on four continents. I wouldn’t be called “The Cook to the Kings” in the Middle East, one of “Washington’s food elite” in the US, or be an award-winning author if it weren’t for her. This past Christmas, when her doctor wanted to admit her to the hospital to live out her final days as she had difficulty breathing, Nonna refused. She mustered up the strength to mumble, “I can’t! I have to go home and make cookies with Amy. ” It was our last Christmas baking together. Thanks to her mentorship, I now dedicate a great deal of my professional work to reclaiming the recipes of the past and making sure that they are not lost. I try to prepare Nonna’s recipes for our family on holidays since I am the only one who knows them. I also share them with my following, because there are a growing number of people who are interested in reclaiming lost culinary cultures. Nonna Angela lived a simple life mostly within the confines of her home or the homes of her children, yet her reach was global. Upon learning of her passing, friends from all over the world sent their condolences, shared the impact that she made on their life, and said how much they would miss her and her baking. Although I don’t even hope to live up to her legacy, it is my dream that each of the members of our family can carry one of the ways in which she inspired us forward. In the meantime I’ll strive to do my best with the baked goods, knowing that, if there are bakeries in heaven Nonna Angela is probably running them. This entry was posted in Inspirational, Women and tagged Amy Riolo, Grandmother, herstory, inspiration, Inspired by my mom, inspiring story, Mentor, nonna, teacher, Woman. Bookmark the permalink. A beautiful tribute. Thanks for sharing.